We are so pleased to introduce our first video class! If you remember back at Quilt Market, we announced our first two block of the month programs for local quilt shops. We’ve now converted the first one into a video course for those of you not near one of the shops running the program! 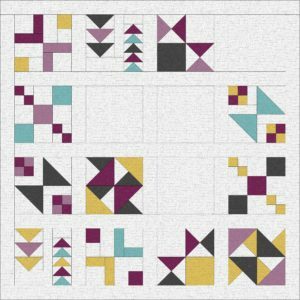 The Filmore Quilt is a modern sampler quilt, with the blocks designed in pairs for a traditional and modern version of each block. While local shops will run this as a monthly block program, the video class releases the 12 blocks one a week, with a 13th week for assembly and quilting guidance. Lynn gives the instructions for cutting, piecing, and pressing for each block with tips for all skill levels. I come in at the end for some assembly instruction and quilting design suggestion. We designed the quilt using the Pixie Dots line and other basics from QT Fabrics for the two colorways. To keep it simple for beginning quilters and preserve the clean design associated with modern quilts, we stuck to just five fabrics. Check out the basics at Fat Quarter Shop for help coloring your own version of the quilt! You can find the course on our new learning website at learn.TheStitchTVShow.com. The first lesson with a video introduction for the class is free, along with the fabric requirements (just five fabrics! ), so check it out.